Make a Positive Impact on Your Community! Donate your items at the end of the sale! WE Care - a part of SW Community Action Program is the receipient of the donations. Donating is easy - when creating your tags, just set your profile to default to donate! You also have the ability to override the default should you chose to pick up some items and donate others. You'll be helping area families who will greatly appreciate your gift, and, you have record of the donation for tax purposes. Be a part of the JBF family who has donated almost $56,000 in the last three years! And, did you know we also donate the admission fees from Friday to the Homeless Coalition? It's another way partner with SW Community Action Program to help families in our communities. When you choose to donate your unsold items, you are helping an organization which has served over 16 counties in Southern Wisconsin since it's inception in March of 2006. 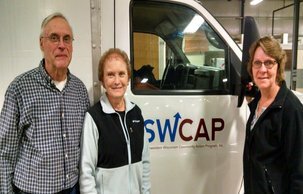 WE CARE was formed a group of volunteers who were concerned about the financial plight of families in Southwestern Wisconsin. Since limited financial resources exist for families in need of clothing, diapers, wipes and other supplies, WE CARE was started specifically for them. Learn more about WE CARE! JBF and the consignors are honored to make a difference in the lives of those they serve! A part of Southwestern Community Action Program. This program targets individuals/families that are literally homeless. It assists homeless persons living on the streets or in an emergency shelter transition and as quickly as possible transitions these individuals/families into permanent housing. And, the program then provides help to achieve stability in housing. Learn more about the Homelss Coalition! JBF is honored to donate Friday's admission fees to this program.